Pledge Drive Update, and GIGANTIC THANKS! The 3rd Quarter WHTM Pledge Drive will soon be coming to an end. I’d like to offer GIGANTIC THANKS to everyone who has contributed, whether your donation was big or small. Your donations make this blog possible, and I am once again humbled by your generosity. Some of you have truly gone above and beyond the call of duty, and I appreciate it greatly. If you have been meaning to donate, but haven’t gotten around to it yet, click that button below! You don’t need to have a PayPal account to donate, and if you live outside of the US, PayPal will automatically convert your donation into US dollars. With another day or two of the pledge drive left, we’re getting ever closer to my informal fundraising goal, but we’re not quite there yet. Your donation can help put us over the top, and then these reminders can cease. Help me to stand up against the misogyny of the men’s rights movement and the more generalized bigotry of the resurgent far-right! Internet antifeminists regularly demand tens of thousands of dollars in donations to bankroll dubious lawsuits and terrible films and $1000 bounties for the personal information of their foes. Also: Thanks for you support on the whole migraine thing. They seem to be easing a bit, but with migraines you never know. Knock on wood! 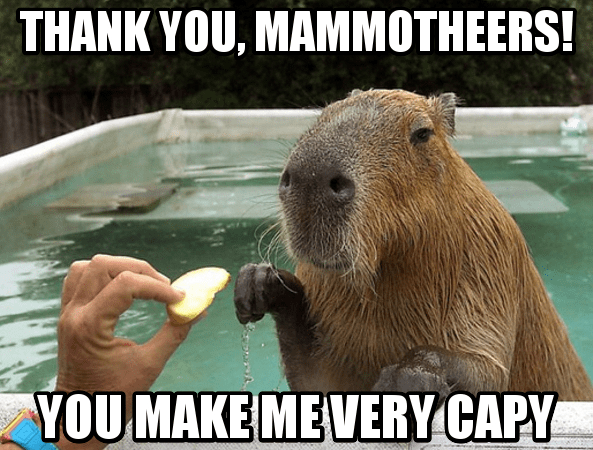 Here’s a bonus capybara for you. I have to admit I donate so that you’ll keep doing this, so totally selfish motivations. I’m thankful for what you do here, David! Also hoping that your migraines have let up and you’re feeling better. I am also thankful that I am now financially privileged enough to be able to donate despite having to drop $1200 on poor Catbeast last week; he spent 16 hours at the vet’s getting potassium IV drips plus diagnoses for kidney disease and heart murmur. We just got back from the vet for a follow-up and everyone was SO impressed with his improvement. He’s also got hyperthyroidism and will start meds for that in the next couple days. Depending on the kidney disease/trainability of cat, IV fluids can be administered at home. If cat can be convinced to put up with it (many can after they realize it helps), can live happier quite a bit longer. Phew, hopefully that means not many more of these creepy rodents of unusual size. I don’t think they should exist. Hambeast, sorry to hear about Catbeast’s troubles, glad he’s doing better! 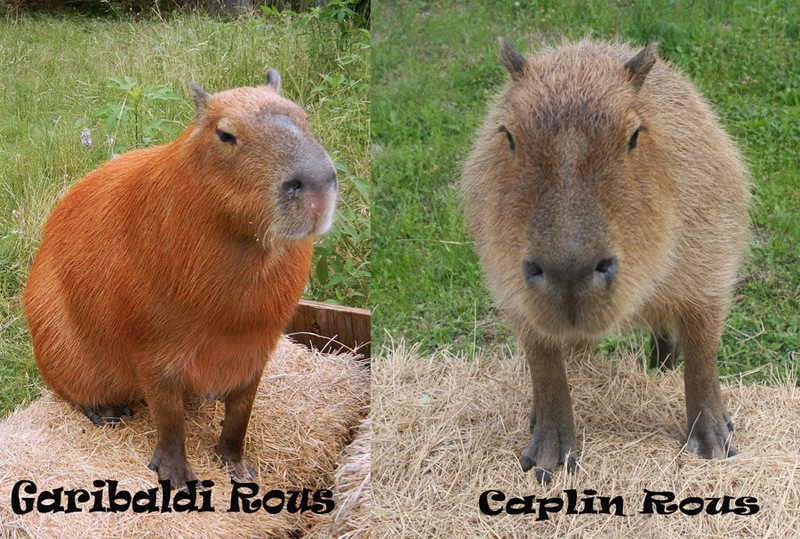 Moggie, yeah, capybaras are rather startlingly large. And they probably make terrible pets for all but a tiny percentage of people who can give them their own pools and enough space to roam and put up with their destructive tendencies. But I still think they’re kind of adorable. Not as adorable as kitties, of course, and I will be returning to them shortly, picture-wise. Good. It is a hard job you are doing, so keep safe. On another hand, there is a french comic book about feminism which has just been published. I do not know if the book is good or not, but you can have an excerpt here. Nota : it is in French, so if the google translate of some of the text seems unclear to you, to not hesitate to ask ! My favorite was the video of the capybara in the pool with the noodle it carefully trapped under its chin then maneuvered under its forelegs. This was practiced use of the toy and very clever. On another topic has anyone heard about the Trump campaign requesting private access on 20thSept to the International Civil Rights Center and Museum in Greensboro, North Carolina, housed in the Woolworth’s with the lunch counter where the famous sit-in protest occurred in the 1960s? Trump was turned down by the museum and this info ‘leaked’ to his followers who promptly took offense and called the museum. “The callers were threatening to come over and burn down the building and to shoot up the building,” for over a week according to John Swaine, the museum’s CEO. The campaign had “No Comment” when asked by reporters. They could have expressed concern over the museum getting threats or denounced the threats and maybe even explored why making threats was wrong as part of Trumps out reach to minority voters. There have been many responding with support after the news of the threats became public. Ok I’m having some sort of technical issue here. The donate button on this page is inactive to me. I’m on an android phone btw. Is there an alternative way to donate? Yeah, it seems broken in this post for me, too (also Android). Scroll down past the reply box to the “Take that, Mr. Misogynist” image and try the link below that. Or try one of the previous posts. JS – We are giving Catbeast subcutaneous fluids (with electrolytes) every other day plus twice daily potassium gel. We’ll be doing this until his blood/urine samples come back normal but so far, it has worked wonders! If your cat is unable to hold its head up, potassium deficiency could be the cause. We’re also feeding him a special food for his kidney issues which thankfully, he loves. Catbeast is a senior kitty with senior kitty issues, but none of us are ready to give up yet! Husbeast and I are looking into senior pet insurance, though because this stuff’s expensive. Donated. Thanks again for all your efforts, David. I don’t know how Catbeast is about taking oral meds, but if that may be an issue compounding pharmacies can make a topical methimazole (hyperthyroidism medication) that you rub on the cat’s ear like a lotion. Just something to keep in mind. Thanks for everything Dave. I’m a bit short at the moment but I’ll chip in once I’m free of this mountain of routine expenses – somehow we’ve managed to get several items all come due at once. One thing I should thank you for. I’m pretty sure it was someone here who introduced us to Keith Olbermann. If ever you wanted _the_ prime, paradigm example of a righteous rant against white male privilege in general and D J Trump in particular, this is it. I am so sorry I can’t donate. My third world monies do not translate into any dollars worth sending.